During the past two weeks of spring break I've been able to schedule in more time with the Little Misses. 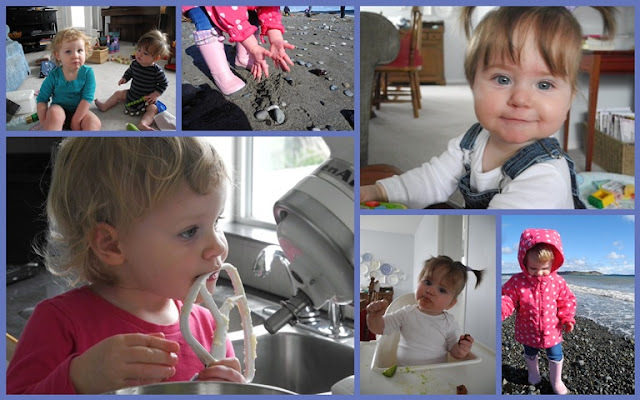 We've baked cookies, returned seaweed to the ocean on a very blustery day, visited the Ocean Discovery Centre, played with blocks and Duplo, read a zillion books, and eaten snacks. What fun we've had. followed by a cup of tea and a little reading. Doesn't that cover look inviting? So full of colour and freshness. Do you have a favourite magazine? But, first things first! Back to the chores! Looks like a lot of fun (well the first and last pics.) Love all the bright spots of pink in the top and bottom too. Have a wonderful weekend. Your collage and your last photo call out to me so much more than the middle two. :) Enjoy your spring break! Being a grandmother is just so much fun! You obviously enjoy the important job. Cleaning is not on my list of chores today....I have a photographer coming later to photograph the "Crying Throughs Series"! Is that the British Country Living magazine? That's one of my favourite magazines along with Selvedge (British) and Uppercase (Canadian). That is one of my favourite magazines and I save it and savour it! I'm on the way home - to much of what you show in the middle photos, I'm sure! They must love it at your house! They are both so adorable and I'm happy to see that you allow beater licking and fun things like that. Aw, your little grand girlies are so sweet. How fun to spend time with them and make sweet memories. I like the British Country Living too and should have picked one up today. They are a very good read! Have a great weekend Lorrie! Favourite magazine....Country Living, of course! How lovely to be making special memories with your grandchildren. They are so cute. I love the pink polka dotted rain coat and the little pigtails. Looks like a fun time was had by all. Having a new magazine to look forward to seems to make the housework more bearable. The CL cover does indeed look colorful and inviting. What wonderful weeks - such darling granddaughters. I like Country Living - just got my new issue in the mail and haven't even opened it yet. Making memories with sweet babies - how wonderful! That magazine cover does look inviting. We don't get many magazine subscriptions anymore. I used to get a bundle! But I look forward to the three that we do get - Garden & Gun, Martha Stewart, and Photoshop. Yeah, that selection pretty much sums me up, LOL! Lorrie, love the new blog colors! Just popping in... your gran is such a little beauty!! I know you have enjoyed the extra time with her. Precious memories!! Yes... an early bout of spring fever is always at least partially assuaged by a magazine like that one. For me, it has been The Cottage Journal (or "Spring Cottage" is how the title on the cover reads this year.) As poor a job as Hoffman Media has done with Victoria, this current issue of Cottage Journal is just the opposite... a feast for the eyes. Glad to see you doing well. Yes, that's MY favorite magazine too - have had a subscription for years and have to say it never fails to excite me, and never has lost any of its excellent format, content, paper/print quality etc., unlike many USA produced magazines which I've recently canceled! Sweet 'little misses' pics as always - won't be long before they'll be willing to help Grandma with the cleaning! !